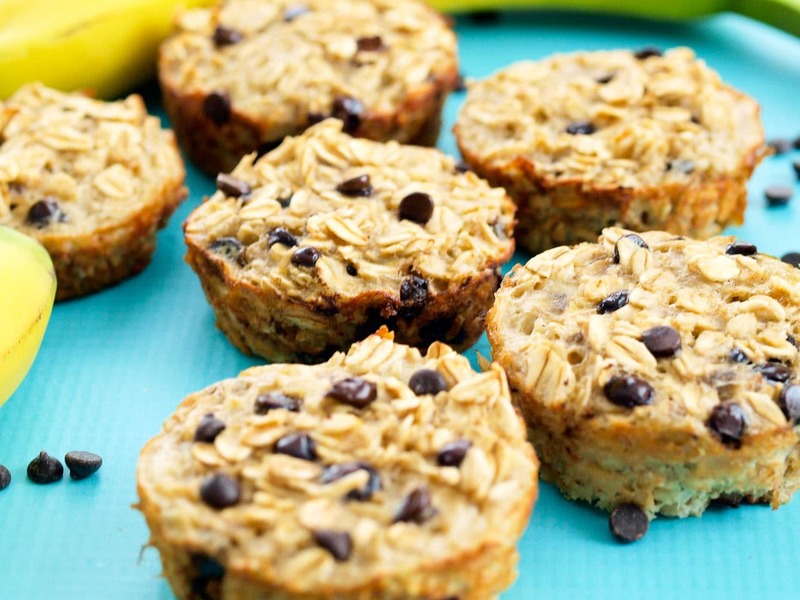 These Banana Chocolate Chip Baked Oatmeal Muffins are a great portable breakfast idea! I make a lot of variations of baked oatmeal muffins since I first started making them almost four years ago. I don’t always think about putting the new recipes here on the blog. I mean, how many baked oatmeal muffins recipes does one need on a blog? Am I right? The third time I made this particular variety, however, my 7-year-0ld daughter, Meghan, said, “Did you put this one on your blog yet? This is my favorite kind.” I was pretty much forced to post this recipe, wouldn’t you agree? If you love the banana and chocolate combination, you will love these. Besides the chocolate chips, the muffins are only sweetened with the banana. 2 full bananas give them a nice banana flavor that banana lovers will adore. 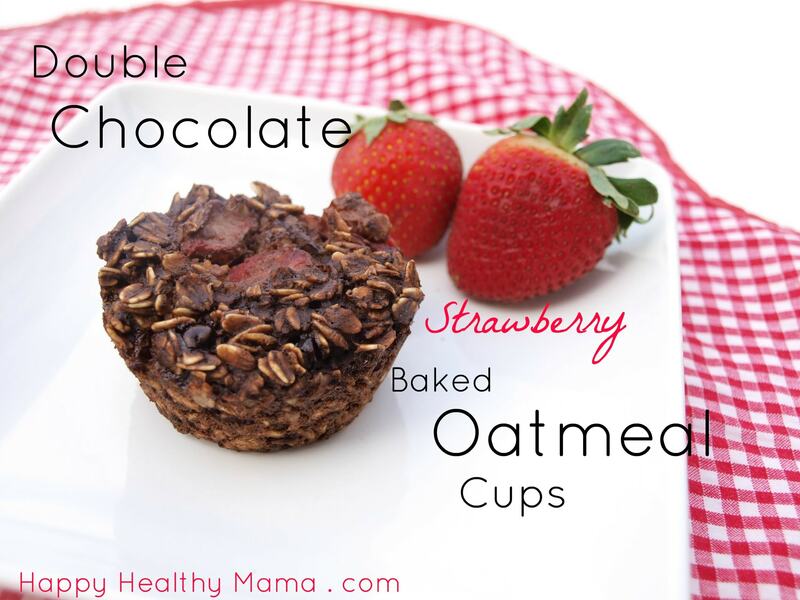 The reason I keep making baked oatmeal muffins so often is they are so easy and the kids love them. You mix everything together in one bowl. You can even mix it together the night before and bake it in the morning. 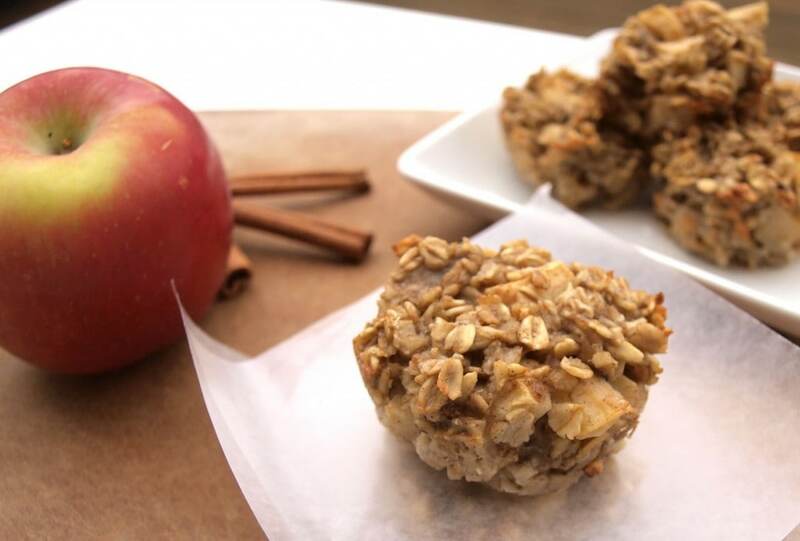 Make a double batch so they last all week long and you have a portable baked oatmeal you can eat on the go. Yes, these do work with a flax or chia egg if you would like to make them vegan. I usually make them in these silicone baking cups. The muffin cups pop right out easily and it makes for the easiest clean up. You can also grease your muffin cups. I have not tried paper liners, but I imagine it would work also. Yes, you can mix it together the night before and bake it in the morning. The texture of these is meant to be creamy in the middle like baked oatmeal. Cook them longer for a less creamy texture. They will be more firm the second day. These are best eaten within 5 days and stored in the refrigerator. 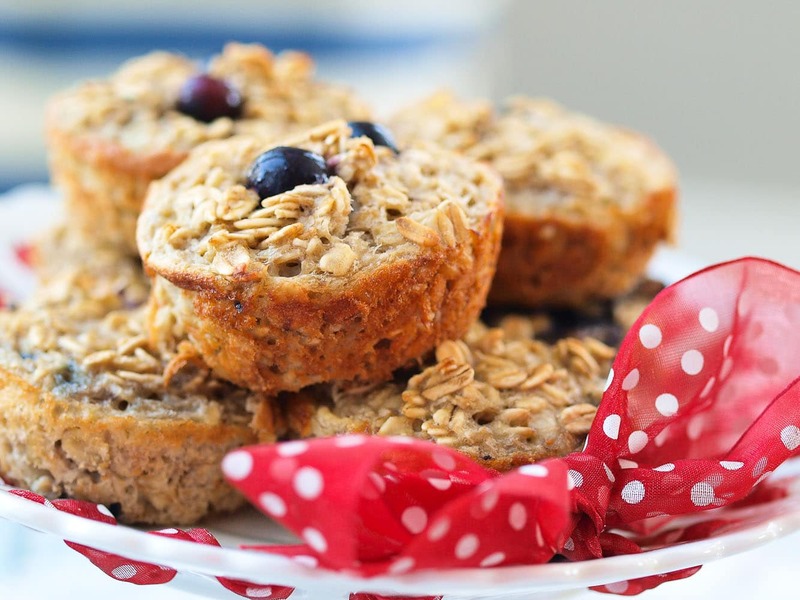 If you haven’t tried baked oatmeal muffins yet, it’s time to jump on the bandwagon! 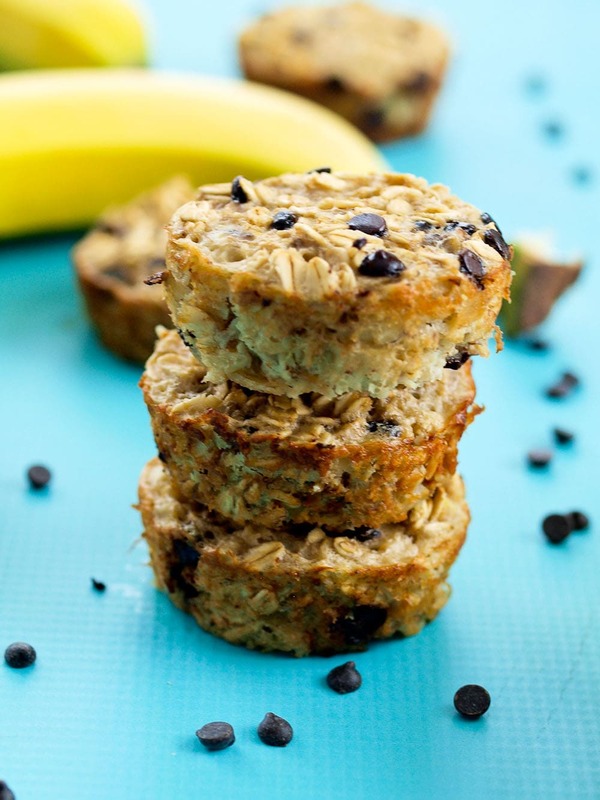 These Banana Chocolate Chip Baked Oatmeal Muffins are a healthy and easy breakfast option. Lightly grease 12 muffin cups or line with silicone baking cups. In a medium bowl, mash the bananas well. Add the milk, egg, and vanilla and stir to combine. 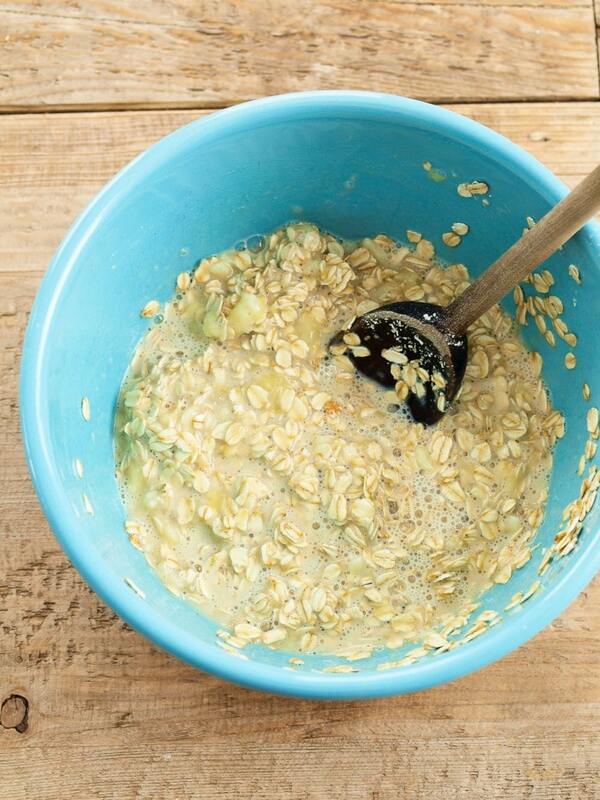 Add the oats, salt, and baking powder and stir to combine. Pour the mixture into the muffin cups and bake in the preheated oven for 20 minutes. Here are the rest of my baked oatmeal muffins if you’d like to try more recipes! Great idea! I’m gonna try these. I love your banana date bars – they are have become a staple in our household. And the recipe is so versatile. This weekend I added grated carrots instead of the applesauce and they are delicious!! Made them this morning and they are very good! My very picky 5 year old just finished one and ask for more! This made a very happy mom! These are so good! My entire family loves them! These were a hit with my hubby, kids and mom! My mom even asked for a copy of the recipe. I made them yesterday and only 2 remain. Oh and they couldn’t have been easier with only one bowl needed. Meghan has good taste :). Love it! Thanks for letting me know! These look tasty and portable – the best combination! These are the best and most convenient muffins ever! The first time I made them, I made them a bit too wet. I had to bake mine a bit longer, but it was still super tasty! I can’t wait to play around with the recipe a bit more. I don’t know how you make yours look so pretty, though! Such lovely photographs. Oh wow! Just made these and I just about ate the entire pan! I thought at first maybe I had put too much milk due to the consistency, but nope! Turned out perfectly. Thank you for sharing this recipe- I am 9 months pregnant and craving sweets at all hours. So nice to have a treat without any added sugars and flour. Great recipe, followed it to a T and they are just delicious! Would this work with quick pats instead? For nutritional calculations, one muffin=one serving. 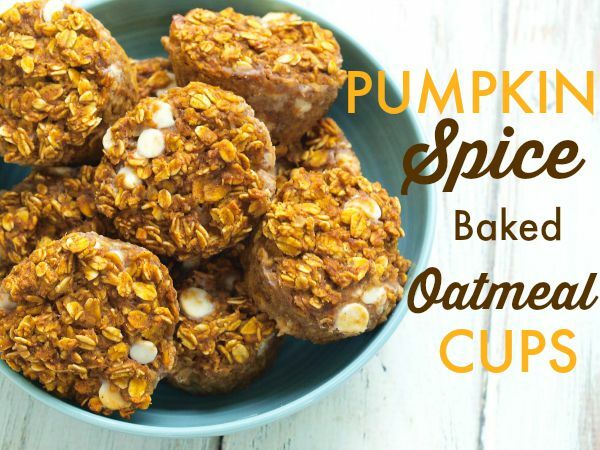 Has anyone tried these using quick-cooking oats? I don’t have old fashioned on hand at the moment. I have made these with quick-cooking oats. Texture is a little different, but it works fine! These were amazing! I doubled the recipe and then realized I only had half the rolled oats so used steel cut and still great! Hubbie, teenager and 2 year old approved! I’d love to try these, but I only have steel-cut oats at the moment. Do you know if the recipe will work if that’s all I have? They will take a lot longer to cook. I’m not sure how it would work–I’m sorry I’m not more helpful. I’ve never tried using steel cut oats with this. How many bananas!!? On my screen it just says ripe bananas! I’m so sorry the recipe wasn’t showing up properly for you. It calls for 2 ripe bananas. Just made them for breakfast….. so good! Thank you so much for the recipe! I have always wanted to make these. I will be trying this recipe very soon. Perfect to go with a gift of jam that I received for Christmas. Thank you for sharing. Would these “survive” being mailed to my college kiddos? Hi! I’m a nanny and I make these for the girls all the time now. I wanted them to be a little healthier (always the goal with toddlers) so I nixed the chocolate chips and added carrots, peanut butter, raisins, maple syrup, and chia seeds. 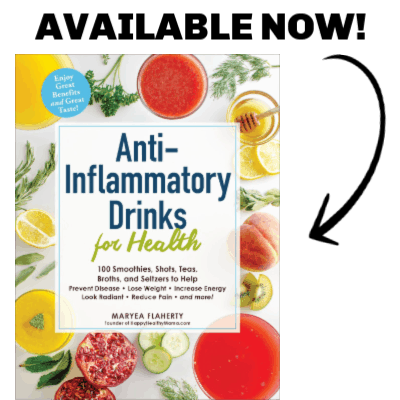 They’re a hit! What can you use innovative lace if the egg in this recipe? What can you use in place of the egg in this recipe? You can try 1/2 cup applesauce! Oh my goodness, they are so ridiculously easy! And so quick to whip up if you just keep oats stocked up. I forgot choc chips so put mixed fruit instead, was awesome. They’re already all gone 1 day on. Def need to buy another muffin tray!! Thankyou for posting.